The flag of France (French: Drapeau français) is a tricolour flag featuring three vertical bands coloured blue (hoist side), white, and red. It is known to English speakers as the French Tricolour or simply the Tricolour (French: Tricolore). The Tricolour has become one of the most influential flags in history, with its three-colour scheme being copied by many other nations, both in Europe and the rest of the world. The royal government used many flags, the best known being a blue shield and gold fleur-de-lis (the Royal Arms of France) on a white background, or state flag. Early in the French Revolution, the Paris militia, which played a prominent role in the storming of the Bastille, wore a cockade of blue and red, the city's traditional colours. According to French general Gilbert du Motier, Marquis de Lafayette, white was the "ancient French colour" and was added to the militia cockade to create a tricolour, or national, cockade. This cockade became part of the uniform of the National Guard, which succeeded the militia and was commanded by Lafayette. The colours and design of the cockade are the basis of the Tricolour flag, adopted in 1790. The only difference was that the 1790 flag's colours were reversed. A modified design by Jacques-Louis David was adopted in 1794. The royal white flag was used during the Bourbon restoration from 1815 to 1830; the tricolour was brought back after the July Revolution and has been used ever since 1830, except with a brief interruption for a few days in 1848. Article 2 of the French constitution of 1958 states that "the national emblem is the tricolour flag, blue, white, red". In modern representations, two versions are in use, one darker and the other lighter: both are used equally, but the light version (i.e. the main version used by Wikipedia) is far more common on digital displays. The light version was introduced in 1976 by President Valéry Giscard d'Estaing for use in televised governmental speeches. It is sometimes even used on official State buildings. Town halls, public buildings and barracks, on the other hand, are adorned with the darker version of the flag. Currently, the flag is one and a half times wider than its height (i.e. in the proportion 2:3) and, except in the French Navy, has stripes of equal width. Initially, the three stripes of the flag were not equally wide, being in the proportions 30 (blue), 33 (white) and 37 (red). Under Napoleon I, the proportions were changed to make the stripes' width equal, but by a regulation dated 17 May 1853, the navy went back to using the 30:33:37 proportions, which it now continues to use, as the flapping of the flag makes portions farther from the halyard seem smaller. Blue and red are the traditional colours of Paris, used on the city's coat of arms. Blue is identified with Saint Martin, red with Saint Denis. At the storming of the Bastille in 1789, the Paris militia wore blue and red cockades on their hats. White had long featured prominently on French flags and is described as the "ancient French colour" by Lafayette. White was added to the "revolutionary" colours of the militia cockade to "nationalise" the design, thus creating the tricolour cockade. Although Lafayette identified the white stripe with the nation, other accounts identify it with the monarchy. Lafayette denied that the flag contains any reference to the red-and-white livery of the Duc d'Orléans. Despite this, Orléanists adopted the tricolour as their own. Blue and red are associated with the Virgin Mary, the patroness of France, and were the colours of the oriflamme. The colours of the French flag may also represent the three main estates of the Ancien Régime (the clergy: white, the nobility: red and the bourgeoisie: blue). Blue, as the symbol of class, comes first and red, representing the nobility, comes last. Both extreme colours are situated on each side of white referring to a superior order. Lafayette's tricolour cockade was adopted in July 1789, a moment of national unity that soon faded. Royalists began wearing white cockades and flying white flags, while the Jacobins, and later the Socialists, flew the red flag. The tricolour, which combines royalist white with republican red, came to be seen as a symbol of moderation and of a nationalism that transcended factionalism. In the aftermath of the November 2015 Paris attacks, many famous landmarks and stadiums were illuminated in the flag colours to honour the victims. During the early Middle Ages, the oriflamme, the flag of Saint Denis, was used—red, with two, three, or five spikes. Originally, it was the royal banner under the Capetians. It was stored in Saint-Denis abbey, where it was taken when war broke out. French kings went forth into battle preceded either by Saint Martin's red cape, which was supposed to protect the monarch, or by the red banner of Saint Denis. Later during the Middle Ages, these colours came to be associated with the reigning house of France. In 1328, the coat-of-arms of the House of Valois was blue with gold fleurs-de-lis bordered in red. From this time on, the kings of France were represented in vignettes and manuscripts wearing a red gown under a blue coat decorated with gold fleurs-de-lis. During the Hundred Years' War, England was recognised by a red cross, Burgundy, a red saltire, and France, a white cross. This cross could figure either on a blue or a red field. The blue field eventually became the common standard for French armies. The French regiments were later assigned the white cross as standard, with their proper colours in the cantons. The flag of Joan of Arc during the Hundred Years' War is described in her own words, "I had a banner of which the field was sprinkled with lilies; the world was painted there, with an angel at each side; it was white of the white cloth called 'boccassin'; there was written above it, I believe, 'JHESUS MARIA'; it was fringed with silk.". Joan's standard led to the prominent use of white on later French flags. Blue Capetian flag was still used during the French Renaissance. It is now the flag of present-day Île-de-France. Standard of the French royal family prior to 1789 and from 1815 to 1830. After the end of the French Wars of Religion (1598), the white Bourbon flag was commonly used. Flag used by the Kingdom of France and the First French Republic from 1790 to 1794. The tricolour flag is derived from the cockades used during the French Revolution. These were circular rosette-like emblems attached to the hat. Camille Desmoulins asked his followers to wear green cockades on 12 July 1789. The Paris militia, formed on 13 July, adopted a blue and red cockade. Blue and red are the traditional colours of Paris, and they are used on the city's coat of arms. Cockades with various colour schemes were used during the storming of the Bastille on 14 July. The blue and red cockade was presented to King Louis XVI at the Hôtel de Ville on 17 July. Lafayette argued for the addition of a white stripe to "nationalise" the design. On 27 July, a tricolour cockade was adopted as part of the uniform of the National Guard, the national police force that succeeded the militia. A drapeau tricolore with vertical red, white and blue stripes was approved by the Constituent Assembly on 24 October 1790. Simplified designs were used to illustrate how the revolution had broken with the past. The order was reversed to blue-white-red, the current design, by a resolution passed on 15 February 1794. Despite its official status, the tricolore was rarely used during the revolution. Instead, the red flag of the Jacobin Club, symbolizing defiance and national emergency, was flown. The tricolore was restored to prominence under Napoleon. 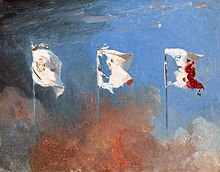 When the Bourbon dynasty was restored following the defeat of Napoleon in 1815, the tricolore—with its revolutionary connotations—was replaced by a white flag, the pre-revolutionary naval flag. However, following the July Revolution of 1830, the "citizen-king", Louis-Philippe, restored the tricolore, and it has remained France's national flag since that time. On 25 February 1848 Lamartine, during the Revolution of 1848, said about the Tricoloured Flag :"I spoke as a citizen earlier, Now listen to me, your Foreign Minister. If I remove the tricolor, know it, you will remove me half the external force of France! Because Europe knows the flag of his defeats and of our victories in the flag of the Republic and of the Empire. By seeing the red flag, they'll see the flag of a party! This is the flag of France, it is the flag of our victorious armies, it is the flag of our triumphs that must be addressed before Europe. France and the tricolor is the same thought, the same prestige, even terror, if necessary, for our enemies! Consider how much blood you would have to make for another flag fame! Citizens, for me, the red flag, I am not adopting it, and I'll tell you why I'm against with all the strength of my patriotism. It's that the tricolor has toured the world with the Republic and the Empire with your freedoms and your glory, and the red flag was that around the Champ-de-Mars, dragged into the people's blood". Following the overthrow of Napoleon III, voters elected a royalist majority to the National Assembly of the new Third Republic. This parliament then offered the throne to the Bourbon pretender, Henri, comte de Chambord. However, he insisted that he would accept the throne only on the condition that the tricolour be replaced by the white flag. As the tricolour had become a cherished national symbol, this demand proved impossible to accommodate. Plans to restore the monarchy were adjourned and ultimately dropped, and France has remained a republic, with the tricolour flag, ever since. The Vichy régime, which dropped the word "republic" in favour of "the French state", maintained the use of the tricolore, but Philippe Pétain used as his personal standard a version of the flag with, in the white stripe, an axe made with a star-studded marshal's baton. This axe is called the "Francisque" in reference to the ancient Frankish throwing axe. During this same period, the Free French Forces used a tricolore with, in the white stripe, a red Cross of Lorraine. From 1912 onwards to today, the French Air Force originated the use of roundels on military aircraft shortly before World War I. Similar national cockades, with different ordering of colours, were later adopted as aircraft roundels by their allies. Personal standard of Philippe Pétain, as Chief of the French State. Flag used by the Free French Forces during World War II; in the centre is the Cross of Lorraine; later, the personal standard of President Charles de Gaulle. A white-crossed regimental flag during the Ancien Régime (here, Régiment d'Auvergne). The pre-revolutionary regimental flags inspired the flag of Quebec (here, the Compagnies Franches de la Marine). Although part of France, the flag of Saint-Pierre and Miquelon does not incorporate the current national flag. The island's flag is based on the historic regional emblems of France. This flag lacks official status. ^ a b c "Drapeau Français". promo-drapeaux.fr. Retrieved 31 January 2019. ^ Smith, Whitney. "Flag of France". Encyclopædia Britannica. Chicago. Retrieved 7 November 2017. ^ Gaines, James (September 2015). "Washington & Lafayette". Smithsonian Magazine. ^ a b c d "Die Symbole der französischen Republik" (in German). Embassy of the French Republic in Germany. Retrieved 28 September 2009. ^ "Le drapeau français" (in French). Archived from the original on 17 February 2012. Retrieved 29 February 2012. ^ "France, the tricolour banner". Retrieved 22 March 2008. "...the standard of France was white, sprinkled with golden fleur de lis..." (Ripley & Dana 1879, p. 250). On the reverse of this plate it says: "Le pavillon royal était véritablement le drapeau national au dix-huitième siecle...Vue du chateau d'arrière d'un vaisseau de guerre de haut rang portant le pavillon royal (blanc, avec les armes de France)" (Vinkhuijzen collection 2011). "The oriflamme and the Chape de St Martin were succeeded at the end of the 16th century, when Henry III., the last of the house of Valois, came to the throne, by the white standard powdered with fleurs-de-lis. This in turn gave place to the famous tricolour"(Chisholm 1911, p. 460). ^ La France du Renouveau - Bourbon Royalist design. Chisholm, Hugh, ed. (1911). "Flag" . Encyclopædia Britannica. 10 (11th ed.). Cambridge University Press. pp. 454–463. Ripley, George; Dana, Charles A., eds. (1879). "Flag". The American Cyclopædia. 8. p. 250. "The Vinkhuijzen collection of military uniforms: France, 1750–1757". New York Public Library. 25 March 2011 . Archived from the original on 8 March 2013. 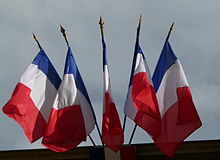 Wikimedia Commons has media related to Flags of France.